Zion Market Research has published a new report titled “Thermal Insulation Market by Product (Cellular Material, Fibrous Material, and Granular Material), by Foam (Rigid Board, Rigid Foam/Foam Board, Flexible Foam, Sprayed Foam, Batts, Loose Fillers, Barriers, and Others), by End-User (Building & Construction, Oil & Gas, Aerospace & Aviation, Mechanical Systems, Clothing, Automotive, Industrial, and Others) and by Region: Global Industry Perspective, Comprehensive Analysis, and Forecast, 2017-2024’’. According to the report, global thermal insulation market was valued at around USD 50,000 million in 2017 and is expected to reach approximately USD 70,000 million in 2024, growing at a CAGR of slightly above 5% between 2018 and 2024. The thermal insulation is used to maintain a hygienic indoor climate at low ambient temperature. The major application of the thermal insulation is to save energy in the cold climate and decrease the heating demand in order to protect the environment. The various end-users for thermal insulation are building & construction, oil & gas, aerospace & aviation, mechanical systems, and others. In various countries, the government is promoting the construction of buildings that are zero energy buildings. There is a high growth in the application of thermal insulations in the single-unit houses, office buildings, hospitals, hotels, and lodging, which is expected to drive the market in the upcoming period. The real estate market is growing at a high rate. The refurbishment activates are also been carried out for the old homes in order to develop the insulation system. Moreover, the key players are also making various developments in the market. For instance, Ashburton Ventures which is one of the key players in the market has done a partnership with ZMM Canada Minerals and has entered the vacuum insulation panel and aims to target the construction industry. The major restraining factor for the global thermal insulation market is high prices of the insulation materials. 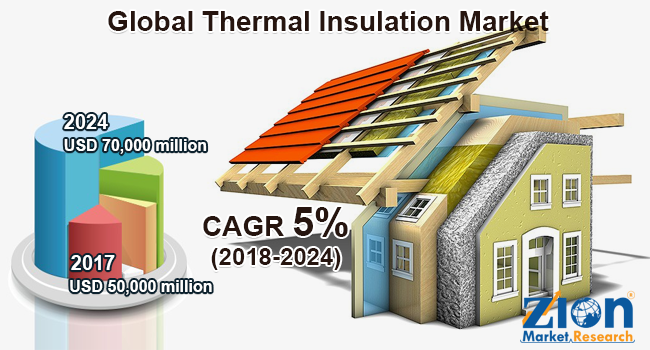 However, high energy requirements are likely to provide many opportunities for the key players operating in the global thermal insulation market. The global thermal insulation market is fragmented based on product, foam, and end-user. Based on product, the segmentation is done as fibrous material, cellular material, and granular material. Based on foam, the segment is divided into the rigid board, rigid foam/foam board, sprayed foam, loose fillers, flexible foam, barriers, batts, and others. Based on end-user, the market is segmented into building & construction, aerospace & aviation, oil & gas, automotive, mechanical systems, clothing, industrial, and others. Buildings & construction is estimated to be the most dominant segment of the global thermal insulation market and is anticipated to maintain this trend over the predicted period. Increase in the construction industry is expected to drive the need for thermal insulation in the years to come. Based on region, the market is segmented into Europe, Asia Pacific, North America, Latin America, and the Middle East & Africa. The Asia Pacific is expected to corner the thermal insulation market in regards to the volume during 2017. This can be attributed to the huge demand for packed food and beverages in various regions. North America thermal insulation market is also expected to witness significant growth during the forecast period. Some of the major players operating in the global thermal insulation market are Asahi Kasei Corporation, Kingspan Group Plc, Johns Manville, Covestro AG, The Dow Chemicals Company, Armacell, Insulcon Group, Isolatek International, BASF SE, Owens Corning, Saint-Gobain S.A., and Saint-Gobain S.A., amongst others. Thermal Insulation Market: End-User Segment Analysis.